Last February, the Philippine TV giant ABS-CBN pushed yet another envelope and this time it’s all about enriching the TV viewing experience of many Filipinos through their latest innovative offering – the ABS-CBN TVplus which is more popularly coined as the “Mahiwagang Black Box”. 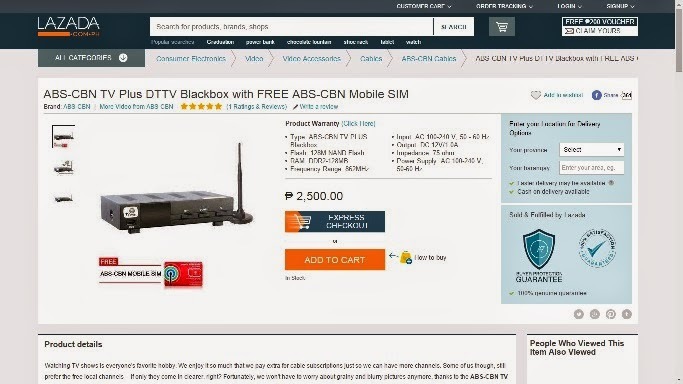 Now, you can get your hands on this “talk-of-the-town” product effortlessly and risk-free through Lazada.com.ph for PhP 2,500 – you can either pay via cash on delivery or credit/debit cards or even PayPal and have it delivered to your doorstep or to your loved ones’ doorstep with Lazada’s free nationwide shipping! It’s that easy! So how “magical” exactly is this “Mahiwagang Black Box”? Well, let’s just put it this way: imagine yourself watching free-to-air TV but with noticeable crispness and clarity. The ABS-CBN TVplus is a digital black box that delivers digitally clear picture and sound that is comparable to seeing a movie on DVD – a far cry from the prevailing blurry and grainy images of analog TV. The“Mahiwagang Black Box” has been developed to work with all kinds of TV sets as long as it has an AV or RCA connector. On top of ABS-CBN and ABS-CBN Sports+Action, the ABS-CBN TVplus allows you to access four more exclusive free-to-air channels once you connect it to your TV sets. The ABS-CBN TVplus is initially available in Metro Manila, Rizal, Cavite, Laguna, Bulacan, Pampanga, Nueva Ecija, Tarlac, Pangasinan, Benguet, and Metro Cebu. But for those living outside of these areas, never fret as the magic of the “Mahiwagang Black Box” will be available to your areas soon!